The first object of my researches was to try and locate a tank with a view to establish a museum and to provide factual information about the story of the battle of Cambrai in which the tank would form the central part of the display. After much research covering a number of years I was rather disappointed that I collected many pieces of tanks, but never the complete item. I had gathered a vast amount of records and with the help of my friend Jean-Luc Gibot, we decided that this information would form the basis of a useful book to cover the entire battle, especially with regard to concentrating on the tank action. At that time, no book was available to cover this need. The first edition was first written in French in 1997, specifically to be ready for the 80th anniversary of the Battle. It was then translated in 1999 by Wendy McAdam to English and extended to include the story of the discovery of the Flesquieres tank. The book title 'Following the Tanks' was selected to indicate that we have tried to retrace the fate of these modern knights and their tanks who went 'over the top' during November and December 1917. It was not always an easy task and sometimes impossible to reach a positive conclusion. The fact that many documents have disappeared or have been destroyed over the years, while others will be in unknown private collections or even still hidden in attics, encouraged us even more to achieve our ambition. In spite of our determination, some records may have even escaped our examination at the different archive centres. Amongst these were the Tank Museum of Bovington, ably guided by David Fletcher who was a key man in our researches, the Imperial War Museum, and the National Archives in Kew. No doubt it remains open to further research, as many past records slowly come to light in the various archive departments and museums. Also, with the help of the digital and information technology, the sharing of research information may well provide valuable links to provide more conclusive evidence. 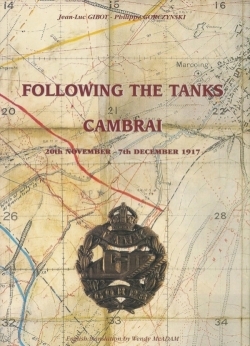 Another important reason for the choice of book title was to indicate that at Cambrai, tanks were the spearhead of the heroic charge with the infantry following behind. Eighty years later we attempted to walk in their tracks and footprints by 'Following the Tanks'! Naturally the discovery of 'Deborah' D51 was literally the culmination of all our hopes. It has created a world-wide interest way beyond our original expectations. The book is now out of print and when offered for sale in bookshops or on the Internet, attracts many prospective purchasers. Proceeds from the sale of the book have been applied to the cost of the monument and museum project. Below are two reviews written when the English version of the book was first published. `Why', the authors ask in their introduction `should we need another book on Cambrai?' It is not necessary to read their answer, it becomes obvious as soon as you leaf through the book. Here is a volume that studies the Tank Corps part in that great battle in minute detail. No book can deal with Cambrai without mentioning tanks, although Jack Smithers had a go, but in this case the authors are looking at tanks and what they did, in greater detail than has ever been attempted before. To be fair this book does give adequate cover to the other arms, including the Royal Flying Corps, and to descriptions of the landscape. the German defences and the origins of the tank All of this, however, is but an hors d'oeuvres. From the moment we, the readers, join the battle Havrincourt Wood at 6.20am on Tuesday 20 November, 1917, the roller-coaster begins. Starting in the traditional way on the left flank, we follow the fortunes of battalions, companies and individual tanks as they roll into action. Working roughly southeast we witness the dreadful events on the Flesquieres Ridge, through Ribecourt to Marcoing and across the St Quentin Canal up to Rumilly. Then it is on again, to Masnieres via La Vacquerie and the famous incident of the Flying Fox II and the collapsing bridge. Any of these descriptions, taken from first hand accounts, give a quite breathtaking sense of being there and carry the reader on, from event to event. with dramatic effect. There is plenty to learn. I, for one, have never been clear about events at Marcoing and whether any tanks ever did cross the Canal; the authors prove that they did, by introducing details such as the fact that the railway bridge at Marcoing was so narrow that only female tanks could get across. Naturally events on the 20th dominate, but the authors take us through the following days, right up to the German counter attack on 30th November, all in the same amazing detail. Sub­sequent sections round off the days up to 7th December, describe how the Germans salvaged tanks from the battlefield and dealt with the many dead still lying on the ground tht they had recaptured. Finally we are treated to a brief battlefield tour and an account of the discovery, by Philippe Gorczynski, of D51 at Flesquieres in 1998. It is easy to get carried away when reviewing a work such as this. There is far more to it than even a lengthy review should cover, but in the end what matters are the impressions. The main one is readily summed up by the word sacrifice. The way the Battle of Cambrai has been presented over the years probably does not prepare us for the scale or the full horror of the casualties. Undoubtedly the fact that the authors have based a lot of their research on the tanks that were knocked out, and among the headstones of the local Military Cemeteries, must mean this aspect dominates. Yet it is no bad thing, especially if it redresses the impression of a walk-over. It was far from that, even on the 20th Novem­ber, but by the end of the month it had become a grim strug­gle. Comparable with any standard set on the Western Front. Mind you it is not all doom and gloom. One little story that will always stay with me is Hotblack and Martel, in civilian clothes and reputedly sporting bowler hats and false beards, touring the area before the battle in the guise of a reporter and a member of the Labour Party on a fact-find­ing mission to the front! It is not for the reviewer to try and sell a book but in this case I shall make an exception. I firmly believe that anyone who ever wore the RTR cap badge, and everyone who wears it today, should invest in a copy. It is not just a question of history and lineage, the volume has been produced to the highest standards, even down to the gold blocked Tank Corps a badge on the cover and it is a privilege to own a copy. But more even than this, it is the obvious way for the regiment to show its tremendous appreciation of the work these two young Frenchmen. who have devoted so much of their time and enthusiasm, not to mention money, to bring this work to us. They deserve our support.